Park Charleston is a newer neighborhood located off Miccosukee Road in Northeast Tallahassee, just outside of Capital Circle NE. Homes became available in 2006 and they are still being built today. As with all boom neighborhoods, existing home sellers are on similar move cycles causing existing home sales to both compete with varying motivation levels as well as with ongoing new construction. 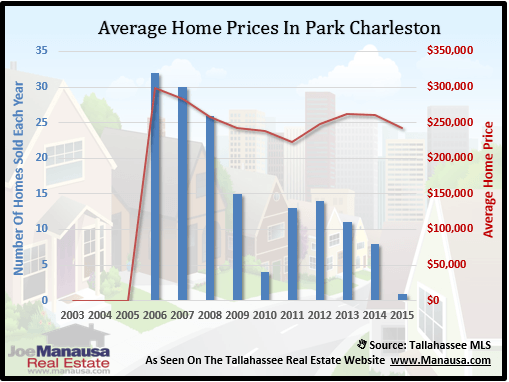 In this report, we will look at prices, values, and sizes of homes in Park Charleston, as well as show current listings in the Tallahassee MLS and all closed home sales going back to the beginning of sales in the popular NE Tallahassee neighborhood. For each of the real estate graphs found in this report, you will find the number of closed home sales for each year (blue columns, measured on the left vertical axis), and an important real estate statistic shown in red (measured on the right vertical axis. It is important to note that sales are through December for all previous years, but through mid February in 2014. Average home prices remained stable in 2014 versus 2013, but have started 2015 with a decline. Overall through 2014, home prices have recovered 17% since the bottom of the market was reached in 2011, but still remain 13% lower than the market peak of $298,000 that was recorded in 2006. Home sales activity in 2014 was the second least-active year since homes began selling, but this is not surprising as existing homes have begun entering the market at prices lower than new construction. 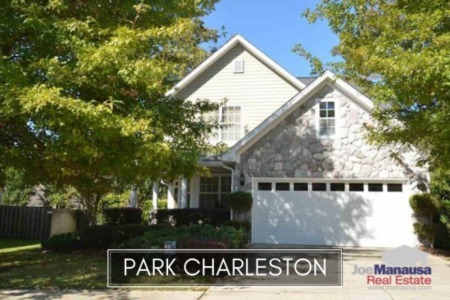 There were 8 closed home sales in Park Charleston in 2014 1 so far in 2015. 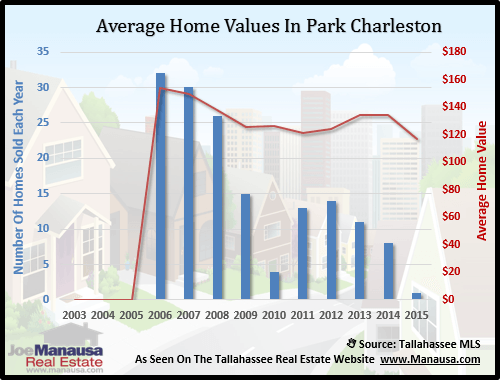 Average home values in Park Charleston remained stable as well in 2014, but the first sale of this year has been quite a bit lower. I would expect lower values as more current homeowners yield to normal relocation urges and put their homes on the market. 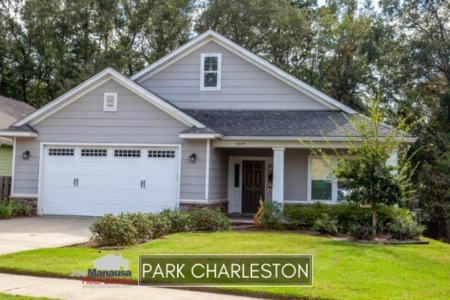 In 2014, the average value of a home sold in Park Charleston was $134 per square foot. This was 14% higher than home values at market bottom in 2011, but still down about 13% from the market high set back in 2006. This means that most homeowners who have purchased or refinanced in Park Charleston are dealing with negative equity situations. 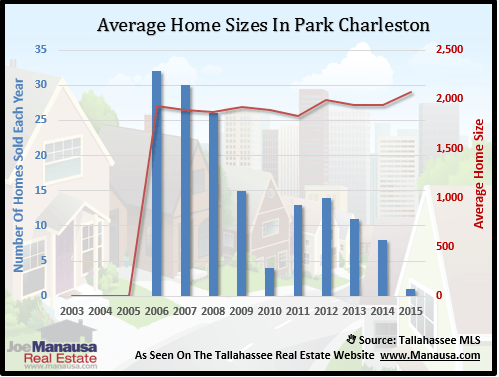 The average home size sold in Park Charleston typically falls in a range of 1,800 to 2,000 square feet, and the results from 2014 show buyers are very near the top of this range. The 8 homes sold in 2014 averaged 1,946 square feet, and the sale this year was 2,077 square feet. Bigger and cheaper is a common trend across all Tallahassee, as buyers try to lock-in as much house for the money using historically low mortgage interest rates. The following list shows home sales going back to 2002 in Park Charleston. I hope you enjoyed our February 2015 update on home sales in Park Charleston, please feel free to drop me a note if you have questions not covered in this report.